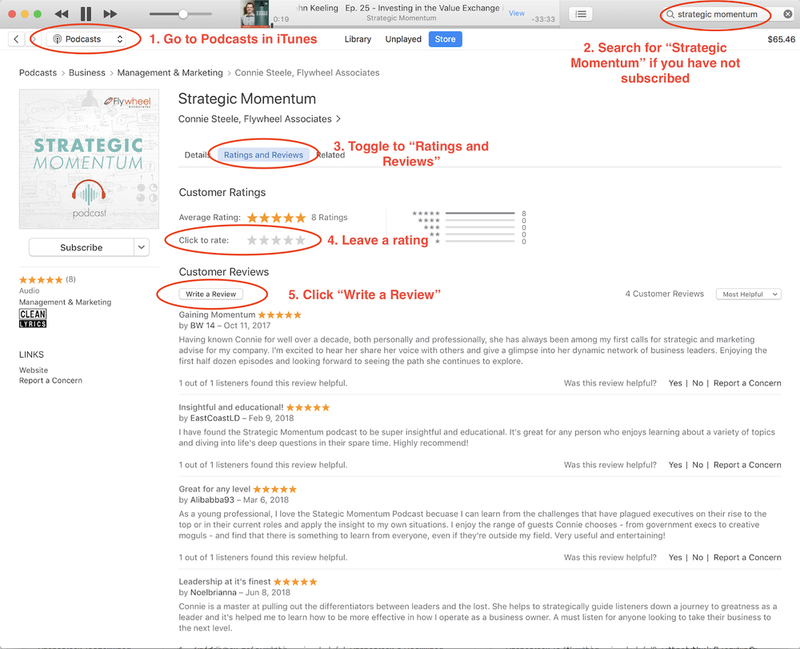 Your ratings and reviews help users discover the Strategic Momentum Podcast. Your feedback also helps us improve our content so we may continue to deliver valuable tips and insights. If you are a fan of the show, please show your support by leaving a review — or simply a 5-star rating — on iTunes. Open iTunes and toggle to the Podcast section (1). Find Strategic Momentum in your subscriptions. If you are not subscribed, search “Strategic Momentum” in the search field (2) and hit “Subscribe”. Once on the page, click “Ratings and Reviews” (3). Click the stars to leave a 5-star review (4). Then click, “Write a Review” to share your thoughts (5). You will be asked to create a title and username for your review. Open the Apple Podcast app. Find Strategic Momentum in your subscriptions (1). If you are not subscribed, search “Strategic Momentum” in the search field and hit “Subscribe.” From the main page, scroll down to Ratings and Reviews (2). Click the stars to leave a 5-star review (3). Below, click “Write a Review” to share your thoughts (4). You will be asked to create a title and username for your review.